What is Nutmeg and How Do You Use It? Nutmeg is a spice made from the seed of the nutmeg tree or Myristica fragrans. This native Indonesian evergreen tree is the source of two popular spices, nutmeg, and mace. Nutmeg is the inner seed, while mace is the red, lace-like substance that covers the seed. Although their flavor is similar, nutmeg is said to have a warmer, spicier flavor than mace. Seeds are dried gradually in the sun over a period of six to eight weeks. During this time the nutmeg shrinks away from its hard seed coat until the kernels rattle in their shells when shaken. Nutmeg has a long culinary history and can be used in both sweet and savory dishes. In the United States, one of the most common uses is in desserts, especially apple or pumpkin pie. Nutmeg is also used in a variety of beverages, such as eggnog, chai, mulled wine, or as a garnish over foamy coffee drinks. It is one of the spices included in pumpkin spice mix and in items that are part of the pumpkin spiced food trend. Nutmeg is particularly well suited for creamy or cheesy dishes and is often added to alfredo or bechamel sauce to create depth. The spicy flavor of nutmeg provides a nice contrast to the creaminess of the cheese. Nutmeg can also be used to flavor meats and is often an ingredient in spice blends such as garam masala or curry. Nutmeg can be purchased in two forms, whole or ground. Ground nutmeg has been milled to a rough powder form and, although convenient, tends to lose its flavor and aroma quickly. For this reason, ground nutmeg is generally sold in very small quantities. Whole nutmeg is approximately the size of an apricot pit and has an indefinite shelf life. 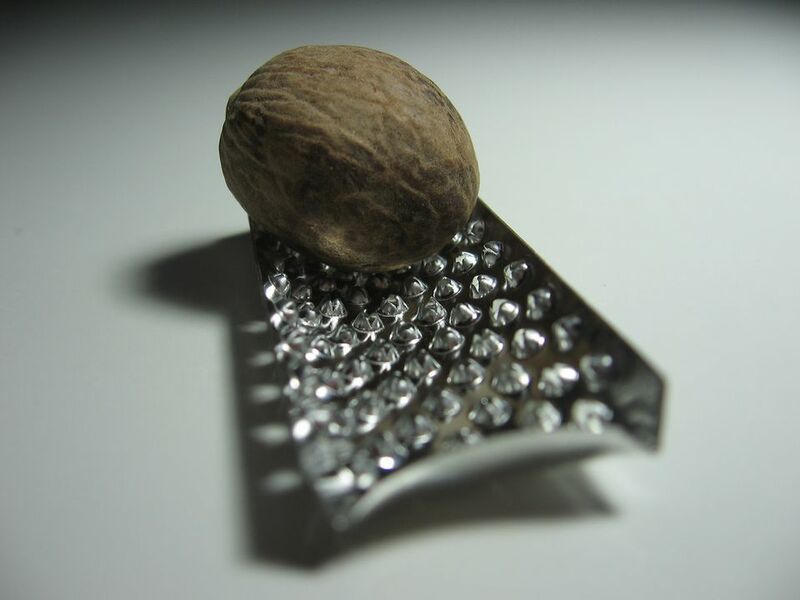 To use whole nutmeg, a microplane or nutmeg grater must be used to shave off a small portion of the seed. Because nutmeg is so strongly flavored, only a small amount is needed to impart a large amount of flavor. Store ground nutmeg in an air-tight container away from heat, light, and moisture. When stored properly, ground nutmeg will retain its freshness for approximately six months. Whole nutmeg will stay fresh indefinitely, but should always be stored away from heat and moisture. If your nutmeg use is only occasional, buying whole nutmeg is the best option because each time it is grated it will provide fresh, fragrant, and flavorful spice. In high doses, nutmeg has hallucinogenic properties and can be quite toxic. Although rare, a few deaths have been reported from nutmeg toxicity, usually in the case of accidental ingestion. The dose required to achieve these effects or potential danger far exceeds any culinary use and caution does not need to be taken when flavoring foods. The deliberate use of it for its psychoactive effects or accidental ingestion of a large amount by a child may result in nutmeg poisoning. Nutmeg is not considered a tree nut. People who are allergic to peanuts or tree nuts are not in danger if this is ingested. It should be harmless.